Holiday Horses and Should You Learn to Ride? It happens all the time. The adorable child launches the Intolerable Whining Campaign and some adult somewhere loses his mind and buys the kid a pony. I'm still angry at the friend who gave my then-four-year-old daughter a hamster for her birthday nearly 30 years ago, so I can't even imagine the lengths to which I would go to get even if a ribbon-bedecked horse had showed up in my family room that day. Yet the insanity goes on, probably more frequently now that Rescue Mania has taken hold of otherwise normal people. No, I'm not anti-animal-rescue in any way. I'm a big fan of traditional rescue and sanctuary programs and a bigger fan of sane decisions about ownership, neutering and/or euthanasia of animals that are beyond help in any way. What I am is anti-abuse, anti-neglect, and anti-stupidity. No small child "needs" a live pony for the holidays. In fact, unless said child resides in an area where winter is warm and sunny and board on ponies is free or affordable on a 25-cents-a week allowance, this is the worst possible time of year to buy a horse. Oh, it's great financially. People unload horses as fast as they can as winter approaches and hay and bedding prices triple. Winter is when horses get skinny, need clothing (expensive clothing), need more grain, and often require vet care that's difficult at best for experienced owners let alone for newbies with twinkling eyes and empty wallets. So before I get to the learning to ride part, I just have to say a word about not giving horses as holiday gifts without the express permission, desire, and commitment of the giftee. As my dear friend Anna often says, "A horse ain't a goldfish". It ain't even a hamster (Helen, by the way, died an untimely and totally unnatural death behind the fridge after her escape from over-handling by a toddler and her bloated corpus was discovered by yours truly stuck to the bristles of a broom), which can at least make a sudden disappearance and turn up under an alias at some other kid's house. A horse is a big, big animal requiring much investment in time and cash and carrying a huge learning curve for the novice owner...a curve that in mid-winter often enters a downward spiral ending in someone's demise. Give a card (or better, a phone call, so there's nothing in writing with which you might later be beaten over the head) with your intentions to buy a horse and see if it flies with parents and child alike. Address it to the sanest adult in the household, not the one dragging a stuffed pony on a plastic lead. And if your offer is rejected, applaud the rationality of the decision and go buy something else. Should You Learn to Ride? As owner of a horse farm that abuts several developments and lies across the street from a high school, I am often visited by curious passers-by who are intrigued by the horses. Sometimes the close-up odor of horse is enough to dissuade them from further interest, but if they survive the smell, and they aren’t daunted by the sheer size of the beasts, and if Zip doesn’t remove any of their clothing or body parts, the discussion inevitably turns to riding lessons. “Do you think you can teach me to ride?” is the anthem of the horse-enamored. I don’t give lessons anymore as a rule, but occasionally, if all the signs are right, I will give a beginner a chance to take that next step and actually sit on a moving animal. For the right person, the sensation of being accepted by an critter as big and potentially dangerous as a horse is an epiphany, and a horseman is born on the spot. That’s a heady experience for all involved, even for Leo, my aging Quarter Horse, who gets to be the starter horse most of the time. He can tell immediately whether the person on his back is going to make it or get voted off my island, and he gets a vote. But before a rider ever steps foot in the stirrup, there are tell-tale signs that indicate whether or not there is potential there. The questions I’m asked are generally the first indicator. If the person asks “how can you stand the smell?” or “don’t the flies bother you?”, I don’t continue the conversation. Anyone focused on his or her own comfort doesn’t need to be around horses. Riding is a hazardous sport. Insurance companies rank it near the top in the “extreme” category and have long lusted after the ability to refuse to pay for horse-inflicted injuries. Comfort can’t be an issue. If, on the other hand, the questions tend more toward “what do you do with him?” and “what do you feed him?”, then there’s a glimmer of hope that this a horseman lies dormant under the Ralph Lauren polo shirt and designer "fashion" boots. A horseman needs to understand what a horse is all about. An interest in the insides and outsides of horses indicates that this is a human who is likely to take this business seriously. Many folks show up here with a bag of something to feed the horses. I’m fine with feeding treats by hand as long as the feeder understands certain rules. This is the next step in the elimination phase of the game. If I say “break the carrot into smaller chunks”, and the visitor ignores me or argues the point, we’re done. If I say “don’t feed this horse because he’s misbehaving when he chews on your hair” and the visitor laughs and announces “it’s just so cute! ", we’re done. The ability to follow directions and a willingness to do so unhesitatingly is vital in a beginner horseman. Again, horses can be dangerous to humans if the humans aren’t aware of some basic horse behaviors and aren’t willing to listen to instruction. The next step is a big one. The “may I brush one of the horses?” request is a positive sign. That the visitor wants closer contact is a plus. That he asked instead of taking it upon himself to act is a bigger plus. Generally, if time permits, I indulge this sort of interest. The horses always enjoy a brushing, and I’m more than happy to let someone else have the pleasure now and then. 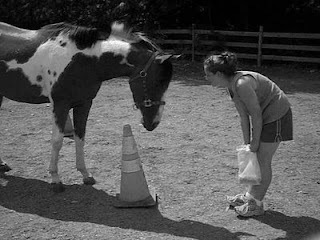 This also gives me a chance to assess direction-following capacity and how well this human bonds with a horse. Some people just seem to naturally understand what horses like. Others won’t get it if I beat them with a stick. The ones who can’t understand “top to bottom” or “don’t stand under his feet” or “he can’t see you there” get a few cursory strokes before I plead imminent death in the family and send them home. Finally, I demonstrate a few of the tricks my guys have learned. This often elicits an “Oh! May I try that?” That’s an outstanding indicator of horseman potential in my opinion. If the visitor successfully gets Zip to sidestep or retrieve something or duck his head on command, and I see that glee in both of their faces that says a fine time is being had, then I am delighted when the next question involves the possibility of a lesson or two. Experienced horsemen encouraging wannabees is what keeps this business alive. Discouraging folks whose motivation is less than stellar goes a long way in the same direction. The young man who wanted to ride a horse to prove he could should never have been allowed anywhere near a barn. He was, he fell, he got stepped on, and he sulked for years afterward. The girl who insisted on coming to the barn to “play with the horses” then cried when a snot-rocket decorated her big hair needed to find another hobby. Manure on a boot shouldn’t bring a budding horseman to tears. The people who are tentative about their commitment to a dangerous sport will be equally tentative in their handling of horses. The ones with a point to make or an axe to grind will be overly forceful and contentious when faced with equine behavior quirks they find challenging. The folks who can’t listen or follow directions are going to get hurt, and often their horses along with them. Assess yourself and your motives carefully. There are millions of horsemen in the world, and you just might be the next to enter this elite corps. But if you’re not up to the challenge, you can’t fake it. Find another sport or simply enjoy being on the sidelines cheering on your horsey friends. Honesty is a winning attitude every time. When Personalities Collide: Should you Keep the Horse or Your Sanity? Butting heads is never fun. Whether you’re gritting your vegetarian teeth while your coworker gorges on a rare burger or you’re sneaking out of bed at night to turn up the thermostat that your polar bear partner insists on keeping at sub-frigid, the stress eventually ruins whatever pleasure you might have found in the relationship. You may not be able to change jobs or leave your mate, but if the conflict involves your horse, you may actually be risking more than your pleasure in the horse-owning experience. You could be risking your life. Let’s talk rationally for a moment about horse ownership. What brought you to the decision to buy, lease, or adopt a horse is key to your own personality. Are you a fixer—someone who feels a certain drive to help other people solve their problems? Are you aggressive? Passive? Passive-aggressive? Are you the strong person your friends turn to in a pinch, or the one who is always leaning on them for support? Are you calm or chronically hyper? It’s your most dominant personality traits that sent you horse shopping, and it may well be those same traits that made you pick a particular horse out of the vast herd of sale and adoptable animals. Most of the time people choose horses that compliment their personalities. The quiet, shy, unassuming girl may choose a calm, older horse with a kind eye and not much energy, while the aggressive, controlling woman might fall for the rough horse with personality plus and attitude coming out his ears. Both would appear to be perfect matches, but in fact only one of these two is likely to result in a successful, long-term relationship. For the quiet, shy girl, the calm, gentle packer is an ideal companion if his quietness is a reflection of a basic generosity of spirit and willingness to partner with a human. A horse that is withdrawn as a reaction to abuse can be explosive when it’s least expected, and the timid rider will find herself overwhelmed. But a careful background check, buying from a trusted seller, and having professional guidance will ensure that this pair will have years of happy rides together and a bond that will benefit both of them. The aggressive rider, however, while drawn to the horse with all the flash and attitude because it’s a challenge, is likely to find herself face-to-face with 1200 pounds of frustration. Successful horsemanship is about finesse, not force, so a confrontational owner will be constantly at odds with a horse who will not back down and escalates the battle at every opportunity. The best way to select a horse is to do so with the guidance of someone who knows you well and is able to be objective in assessing both your riding abilities and your personality. An instructor, a trainer, or a horse-wise friend who is willing to try out the horses you’re looking at and give you an honest report on their perceptions of those animals may help forestall the anger and frustration that results from a poorly-conceived partnership. I hedge here with the "may" because no one, not even the most experienced horse trainer, can truly assess an animal in one or two rides and guarantee a fault-free result. Some horses take longer than others to show their true colors. If you’ve already made the mistake and bought the wrong horse, are you destined to spend the rest of your riding life dreading trips to the barn? It can get that bad. Many horses wind up abandoned at boarding farms either due to lack of funds or lack of enthusiasm on the part of the owner, but personality conflicts often underlie the decision to walk away and just never go back. Since abandoned and neglected horses are a serious problem in this country, it would be a positive step if more buyers would make better choices. There are lots of people who will enthuse ad nauseum over the lifetime commitment we make when we buy a horse. While it’s certainly a lovely thought—more common on the East Coast and in urban areas than in the West where horses are for work as often as for play—that every horse will have a permanent home with a loving owner, it’s also unrealistic. If you have made a bad marriage with an equine with which you’ve developed irreconcilable differences, move on. Sell the horse to someone more his type, and either forget about horse ownership for a while or ask for help in finding a horse that really does suit your temperament. The riding life is a beautiful thing, but an extreme sport like riding is not a good venue for testing the validity of your therapist’s work. Fewer bad marriages, whether to a fellow human or an equine partner, mean fewer divorces, and everyone comes out ahead. Extroverted (outgoing) or an Introverted (reserved and private)? Orderly (clean and neat) or Disorderly (messy and disorganized)? Emotionally Stable (calm and at peace) or Emotionally unstable (easily upset)? Inquisitive (curious and creative) or Practical (more realistic and rigid)? It's easy to make some erroneous connections with the types of horses most likely to find success and happiness in the hands of the personality types above because the plan isn't foolproof. For instance, a selfish owner should find a selfless, forgiving horse to be a pushover and easy to own while an assertive, less willing horse might cause endless conflict. That won't prevent him being drawn to the flashier animal for other reasons, like pride of ownership that can go hand-in-hand with selfishness. An emotionally unstable owner might be drawn to an equally unstable horse figuring, "Hey! He should get where I'm coming from!" while a more stable horse would be more suitable. A disorganized owner will play havoc with the brain of an overly-dependent horse that needs all its i's dotted and t's crossed at all times. Keeping in mind the parameters and assessing both horse and riding on the scale is a good step forward, but might best done by a horse professional with experience in placing horses with appropriate owners. An instructor or trainer might be the best bet. Unseen and untested via the Internet...not so much. How you answer the quiz questions should help to guide you in selecting the right horse and making a happy horse life for you both. Put each horse you look at on the same scale, and think rationally about how the two of you will mesh. It’s worth your time and possibly your life to leave your ego at home and choose wisely. The internet has crumbled the edges of reality considerably, however, and sorting through the rubble can be time-consuming and even hazardous to one’s health and sanity. Information junkie that I am, I have spent many, many hours reading, listening to, and verifying (or being unable to verify) tips I’ve been given. When your barn buddy tells you something, you may or may not doubt the source depending on his status in your small group (see "Herd Dynamics are Your Friend"). When you're taking as gospel something you read online, you need to be a tad dubious. Sometimes it pays to be just a little bit leery of anything that sounds as if it might have come from a free-range maven holding court on a horse website forum. Any training tip that begins with “horses always” or “horses never”. If there is one thing any successful, experienced horse person will tell you, it’s that horses will surprise you at every opportunity. The same horse that has never spooked at a flower box in his life will be happy to show you that he’s only been waiting for an appropriate moment to go full-on idiot in front of your friends, family and fellow competitors. A horse who has always stood for the farrier will, when least expected, rear up and fling himself to the ground with a Shakespearean flourish. You may train 200 horses to happily bend at the poll using draw reins only to have number 201 flip over and challenge you to a duel for even thinking of it. Mentally change that one to “horses often” or “horses may”. If you're not convinced, check this article from The Horse called, appropriately, "Conformation Conundrums". It's a single tip of a complex iceberg, but you'll get the picture. Any management rule that sounds too different from what you’ve been doing. Unless you are a rank beginner with absolutely no knowledge of horse management or you’ve been just making it up as you go along, any suggestion that diverges at a steep angle from what you’ve been taught over the years deserves to be researched before you leap on (or off) the bandwagon. For instance, there is a faction of horse owners who are very vocal in their opposition to regular vaccination against disease. You may, after checking with your vets and other real experts, decide that you agree with those owners. But any drastic change in your management plan can have a long-term effect on your horse, (and, by extension, your vet bills and your training budget) so be sure you know the whys and wherefores of the suggestion. For instance, here's an article ("Sweets" ) from Science Daily that flies in the face of this article ("Food Rewards") from The Horse. Both are based on current research, so what's a newbie to do? Any hint that begins with “the judge won’t like” or “the judge will love”. Sure, there are basics that will impress a judge, but judges are people first. Unless the person giving you the suggestion knows the judge personally or is standing next to you in the flesh assessing the competition, it's safe to ignore their helpful hints. I’ve spent enough time along the rail and in the ring to know that not everyone has your best interests at heart. Use your head. Watch a few classes and see for yourself what the judge does or does not like. If you’re going to take online advice, make sure it’s coming from folks who are experienced and successful enough to be making such statements, not from strangers whose credentials may be limited or totally fake. Suggestions that appear to be in any way dangerous. A good trainer will not push you to do things you are not happy doing or that you don’t feel safe with. A good friend will not suggest that you do things that will put you or your horse in harm’s way. If a fellow horseman--particularly a total stranger--makes fun of you for avoiding what you consider a hazard, you need to ignore the criticism and rethink your relationship with that person. “Just beat him until he does it” falls into that category. So does “if you let him get away with that, he’ll never respect you again”. There are gray areas in horse training where a feel for the horse and a little understanding of task analysis and horse psychology are valuable tools. Sometimes you may need to turn to a pro--up close and personally--to get you past a hitch in your training program. Here's a little insight into how trainers can minimize (or maximize) the stress on you horse: "Training the Trainers"
You're on your own for your own hazard control. Usually, if the horse isn't stressed at breaking, the rider won't be in nearly as much danger later no matter how idiotic his choices. In the horse world, this is not always the case, but you are likely to hear these words frequently. Horse dealers use them a lot. So do fellow competitors who paid too much for their horses or their training. There are times when spending money is the best solution, but now that an auction horse that cost under $1000 has already made it to the Olympics, the wisdom of spending more than you can afford has to be questioned. Good-quality tack can be moderately priced, and you are generally safe in avoiding the big-name imprints unless you're buying second hand and online. Yes, you will pay a higher price for better quality, but there is a break-over point at which the quality stops improving and only the cachet continues to rise. You don’t need to be trendy or spend huge amounts of money to be successful. You only need to define success in terms you can manage. Change that one to "An educated shopper is more likely to get what he paid for." I’m sure there are more than just these five tips that could stand to be avoided, but if you can get this list under control, the others will become more apparent. You have nothing to lose by applying common sense to your horse life and everything to gain! 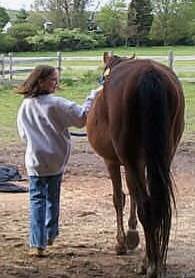 In the interest of better human/horse relations, and as part of my continuing effort to educate the horse-sense-free, it seems appropriate to share some of the things I’ve learned from my horses over 40-odd years. For those who have only recently dropped into the horse world via a rescue horse or whose child has helped you take leave of your senses by attaching herself to some local equine, these hints may get you over a rough patch or two. Take these tips for what they’re worth; they’re straight out of the horses’ mouths. Horses don’t “need” to work, but they do enjoy it. If you’re worried that Buzzcut will languish without your daily training, you can wipe that concern out of your mind. Sure, he may lose muscle tone if he’s left to stand in a stall, but that would be abusive anyway, and not something the Caring Horseman would ever do. Your idea of work and his differ considerably. His job is to eat the grass in the pasture, run around when the mood strikes him, and keep the rest of the herd apprised of changes in circumstances. He’s happy in that job. But he also enjoys the games you have given him to learn. Whatever you call it—English, western, dressage, eventing, reining—it’s a game to him, and he’ll play it for as long as he can if his cooperation elicits positive responses from you. Breaks in routine are not bad for horses. Horses like to be able to predict how their days will go, but they’re not as wedded to the specifics as some humans would like to think. Physiologically it is best for Dust Mite to eat her grain at twelve hour intervals, but she’s not going to colic if she’s fed at 9 AM one day and 8 the next, though bigger changes might cause her to bolt her food figuring she can't trust you to tell time, and that can be a hazard. She may get confused and show up at the wrong time, but she’ll get used to it. Small changes can be good for a horse’s soul. Keeps things interesting. A horse locked into a routine will be more likely to be upset by necessary changes like long trailer rides or her owner’s sudden warped desire to show her in a daybreak halter class. Horses like to be around other horses. This is really important. The fact that Bungee screams like a banshee when strange horses are nearby doesn’t mean he’s not enjoying the interaction. Horses are herd animals, and they like interplay even in the barn. Let horses see each other and even touch each other whenever possible (and safe). There will always be tiffs, but the solution is rarely solitary confinement. In all fariness, there will arise moments when even the most sociable equine will sigh, "I vant to be alooooone", as stolid Leo recently did when he packed up and moved into his one-horseroom apartment in the front field, but he still wants the herd when the wind blows and the sun sets. Horses like to be around people. For the most part, horses—for no reason anyone has been able to determine—enjoy human companionship. Maybe it’s curiosity. We've got to be pretty odd-looking, and our behavior often defies even our own efforts at explanation. 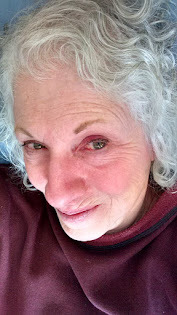 Try sitting in the pasture, just sitting on a rock or mounting block or whatever else is handy and safe, and just wait. At least one horse from the herd will come to see what you’re up to, and often he’ll opt to abandon the herd for a bit and just hang out with you. I got past a persnickety mare, whose rider found her displays of aggression during tack-up daunting, by simply sitting in the pasture reading. It didn’t take long for her to visit, and within a day or two we’d become reading buddies. From there it was a small step up to tacking without intimidation. I did read The Black Stallion aloud to her, but I don’t think that’s a requirement. Horses don’t necessarily feel better locked in the barn during bad weather. We have not reached a consensus at this point, but over the years I’ve discovered (and recent research by actual recent researchers confirms to be a 60/40 split vote) that some horses prefer shelter during lightning storms and high winds while others get nervous when they can’t see the source of the noise. Safety is all-important, so I opt to avoid a repeat of the bale-feeder lightning strike that sent my herd flying to spend the night in the farthest pasture behind an attorney's house (no subliminal message there, right?). High winds mean falling trees where I live, so anything more than 20 mph is sufficient cause for alarm. But extremely high winds that change direction generally result in a barn full of very excited horses when the storm has passed. They’re safe, but not necessarily happy. Horses get emotional over death and illness. The key to understanding this is to think like a horse for a minute. Sick horses and sick people smell funny and act wrong. This is disconcerting to a creature who relies on body language and odor for communication. Death means a pasture mate who had a position in the herd (you count as pasture mates in this regard) is no longer fulfilling that role. This not only requires some serious rethinking of the level of danger in the surroundings, but it also calls for an election with all the hoopla that accompanies it. Whether the process can be called “grieving” is still under study, but there is no question that loss is felt deeply and illness in one herd member or a human caretaker can lead to unusual behavior patterns that may baffle the casual onlooker. Horses are smart enough to know when something is amiss in their environment. If the entire herd is standing staring at the same spot, trust them to know there’s something there. It might not be anything of interest to a human, but it’s of interest to them. The interesting things category at my place includes the line of stopped cars at the entrance to the high school across the way. It also includes the bear ripping the siding off the chicken coop next to the pasture fence. Learn to tell the difference between a facial expression and body language that scream “predator!” and those that simply indicate bored horses who found a momentary diversion. As a group member, you are automatically subscribed to this service, so make use of it. 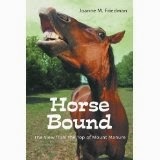 Horse behavior is often amusing, sometimes startling, but rarely impossible for the Caring Horseman to understand. Keep trying. You may be stunned to find out that you know more than you thought you did. Most horse owners are aware that overwork can cause their equine partners to feel stressed. We’ve all heard the admonitions against long trailer rides, heeding the warning to let the horses rest every few hours. Recent research has shown that horses actually don’t enjoy those short rest stops and are perfectly capable of riding in a trailer for more than eight hours at a stretch without any more stress than they feel after a much shorter ride. Let’s face it, for an animal designed to roam the plains with his buddies, scarfing up an endless buffet of greens, any trailer ride is stressful. Sparky would be happier left to his grazing despite your belief that he really “gets” the whole competition thing or knows in his heart he's going to a better place. Five minutes is as bad as five hours when you're a horse and can't control your situation. The current (11/2010) issue of Equus reports the results of a study entitled "Cortisol release, heart rate and heart rate variability in transport-naive horses during repeated road transport" from Domestic Animal Endocrinology, October, 2010. Translated, that means someone did some research on how homebody horses do with a lot of trailer time. The answer is, "not well". Even a seasoned traveler still shows signs of stress in the form of increased cortisol production. Cortisol is that nasty hormone that makes us humans pack on belly fat when we're unhappy and under stress. It's not good for horses, either. The study revealed that though "heart variables tended to decrease with each trip, indicating adaptation to travel", cortisol levels remained high, indicating that these were not happy campers. So it follows without any stretch of the imagination that a rescue horse that has been shunted from home to dealer to auction to quarantine to rescue to your backyard is about as stressed as he can get even if he's spent his life traveling to shows. And that level of travel-induced upset, added to changes in diet and possible mishandling over a period of time, topped off with exposure to illnesses and the possible subsequent treatment thereof....well, is it any wonder some of the horses just don't survive the help they're given? None of these absolutely indicates that stress is the cause. If Warthog has cribbed since he was a youngster, then cribbing when he’s eighteen isn’t news, it’s habit. If he’s always been a picky eater, and you’ve recently changed feeds, then turning up his nose at his new grain ration isn’t a change. We’re looking for unexpected and otherwise unexplained changes in your pal’s demeanor and behavior. As you look at these lists, it should become apparent that some stressors will naturally lead to particular behaviors. Recently on an equine discussion forum a poster mentioned that her horse was suddenly going ballistic in his stall. It took the poster some sleuthing to discover that a loose electrical connection was creating a stray EMF (electromagnetic field), which was freaking out the sensitive animal. Ever clip your horse while you were both standing on a wet wash stall floor? My poor mare developed a nervous tic from the zing! she was getting every time the ungrounded clippers touched her. Rain rot, a common bacterial infection that results from poor grooming and too much time in the damp, is generally easy to cure with a mixture of petrolatum and iodine and a good rub with a nylon kitchen scrubby. Add a new barn with hostile pasture mates, however, and you will find, as did a friend of mine, that your horse is covered head-to-hoof with large, weeping sores despite your best efforts. A vet call and oral antibiotics will generally cure the infection, but only a change of venue will keep it at bay. The important fact you must not ignore is that what’s stressful to your horse is not necessarily even on your radar. A hawk killing a rabbit in a field near the riding ring might be of only passing interest to you, just another Nature at Work moment. But to an already-skittish mare, that incident might foreshadow something larger and meaner lurking in the treetops. Horses, you know, can't see above them. When she suddenly goes from long-and-low to stargazing, another round with the draw reins might convince her you can’t be trusted to keep her safe. Thunderstorms might get a big “so what” from the herd as long as none of them has ever gotten zapped. My entire herd—even the ones who didn’t live here at the time of said incident—has taken to rushing to the barnyard gate at the first rumble ever since the time a bolt hit a tree, ran down the trunk, through the ground and up to the steel bale feeder where the residents at that time were gathered for an evening snack. Added to the mix is the relative sensitivity of individuals equines. Last week, for instance, I pulled 15 ticks from the soft underbelly of my hypersensitive Zips Drama King. He flinched, fussed, and threatened to swoon for two days afterward. He would only travel to the left. He asked for (and was denied) a special audience with the Famous Trainer of his choice. The next day I pulled 10 from his buddy Dakota. Not so much as an eye blink ensued. Individual differences are huge in diagnosing a problem, and they complicate dealing with an unknown animal a nearly otherworldly experience. Overall, you need to think like a horse. In a recent interview, Ray Hunt cautions riders and trainers not to maintain a predator/prey thought process when working with horses. I agree that we need to see ourselves as partners, but we also need to keep in mind that horses are prey animals. They are sensitive to threats of all kinds in their environments. They are herd animals, so the extended family group is all-important, and changes within it are as hard on them as the new in-laws were on you. They like to feel safe and comfortable, so changes in their routines, their living quarters, their turnout are all upsetting to them. We lost three horses in a few months—one to euthanasia and two who left for greener pastures. During that time, each departure of my daughter’s trailer took another long-time pasture pal away, and the trailer returned empty every time. It took more than a year for Zip to stop freaking out each time he saw that trailer. It didn’t take a genius to figure out that he was worried that next time it left, he might be aboard and headed for parts unknown. There’s a lot of speculation and some research afoot regarding whether or not horses can think at a level high enough to fear death. Anyone who’s ridden through a sensitive horse's maniac-squirrel spook knows the answer. Be aware. Think twice before you punish your horse for something he can’t change. That too—inappropriate or unearned punishment—is stressful for your buddy. When you see the signs, set your agenda aside and look for a cause before the problem becomes chronic or dangerous. But there's another level to this issue. With the economy frozen and horses wandering the land like vagabonds begging for homes, many people are winding up with horses for whom stress is simply a given. How is an owner of a horse in this condition supposed to tell which behaviors are habit and which are stress-related? It's not easy, and there's no magic mirror you can look through to find out. But given that idiosyncratic behaviors are incredibly difficult to change--intermittent reinforcement is the bugaboo here, and it's impossible to live with your horse 24/7 to make sure you catch and extinguish every single episode--it's possible to assume that if you're able to get the horse past it quickly with some down time and calm attention, it's probably stress-related, not a long-term habitual response to his life. For a novice owner of a rescued horse or one with a dubious history (What....sellers aren't always honest? Really?) this can present quite a serious situation. An owner without the long-time experience to know how to extinguish behaviors through training is likely to feel overwhelmed by the sheer volume of crazy that accompanied his new horse off the trailer. This is where experienced horsemen and rescuers can really shine. Naturally, a novice's best bet is to buy a horse that has a known past that can be checked and rechecked with former owners close at hand to answer questions. Even in my dreams, that's a stretch. But taking a horse from a rescue that does rehab at very least and retraining at best is a fine place to start. Novices should shy from the unknown as readily as Zips Bizarro shies at drifting oak leaves. And a novice in a boarding situation where one horse is all s/he can afford, where there's a weak support system to help him over the hump and lots of "Do you know what your horse did? ", is just a mess. Period. Full screening of adoptive homes is possible for rescues and should be the rule, but the game is over if novices are going to jump the gun and buy a horse without proper vetting of horse or home. and without the information they need to make a good decision. My best recommendation is that that situation be avoided at all costs, even if the cost is a horse having to wait for a more experienced owner closer to home to come along.